Elizabeth Ride has sent this photo of Cheung Chau in 1936 showing street lighting, which she thinks may be gas. And a row of barrels in the background on the seawall. Elizabeth wonders if the barrels were being imported or exported from the island. Can you confirm it is indeed gas street lighting and suggest what lovely delights are hidden within the barrels? Thomas Ngan suggests looking at this http://gwulo.com/node/13000. 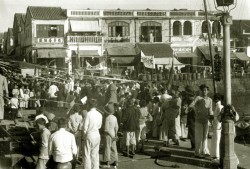 This is a photo of Tai O in the 1930s which shows wooden tubs. trestles, planks, mats and round trays. A similiar scene and period to the Lindsay Ride photo above. Also comments from David Bellis and Thomas himself about what the picture shows. HF: What about the street lights on Cheung Chau. Can anyone provide further information about these? This article was first posted on 10th March 2019. You may refer to this thread (http://gwulo.com/node/13000) for the same question about tubs/barrows raised by David. I’ve put a link to the gwulo node into the article. 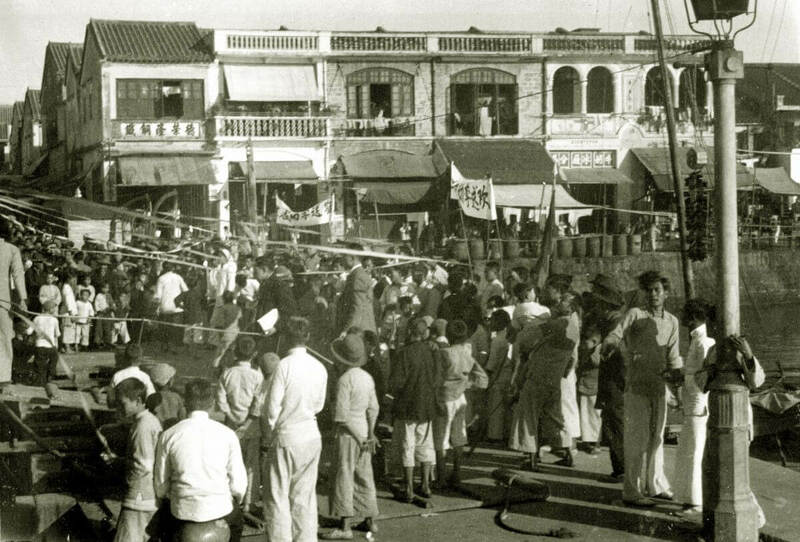 Tai O – 1930s, Cheung Chau 1936. Can anyone provide similiar images from the elsewhere in HK in the 1930s? And on products, processes and families, companies involved? The barrels were outside of the Dairy Farm Ice Factory. The one on the right looked more like regular 200-liter steel drums to me, with the 2 characteristic horizontal ribs around its girth. Notice the firecrackers hanging on the street light. The occasion was to see somebody off, likely going overseas, or maybe somebody retired from the ice factory?